Kip says annuals should be pulled up by the roots and added to the compost heap. What a difference a frost makes... 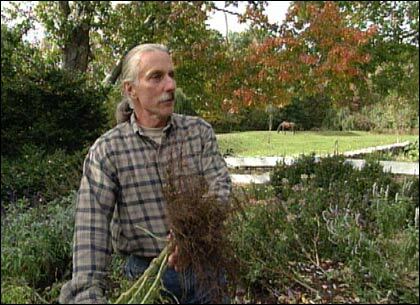 The Victory Garden's gardener-in-chief Kip Anderson shares his wisdom on winding things up for the winter. It goes without saying that depending on what region of the United States you live in, changes in season will occur in different ways and at different times. Here at the Victory Garden, in New England, early November is the time of year we see our flowering annuals wither and die when touched by the first frost of fall. At this time your annuals can be pulled out and taken to the compost bin to start the natural cycle of soil enrichment for next season's planting. So too the empty beds may be replanted with hybrid tulips. If you take good care of your soil during the season, no amendment is necessary at this point, since each tulip contains all the nutrients it needs within the bulb. They can in their turn be dug up and discarded after flowering in the spring. 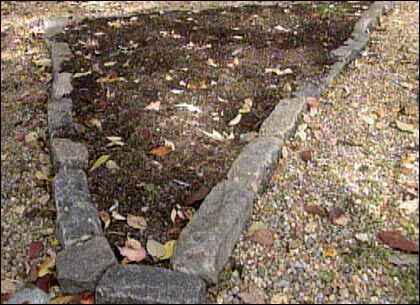 Or, of course, you can simply allow the beds to lie fallow until warm weather arrives for good the following year. 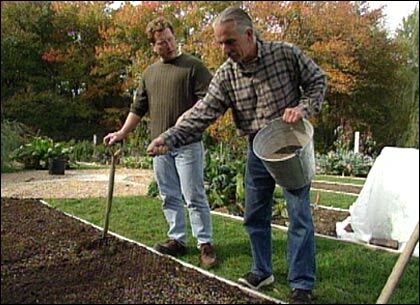 Kip planted tulip bulbs in the Victory Garden's cleared parterre annual beds. Vegetables are much the same as annual flowers. Most vegetable crops grow from annual plants, though some vegetables (such as Brassicas and root crops) may linger in the garden until hard freezes come. But vegetables are also the most finicky plants we grow in the open ground, so wherever possible we follow them at the Victory Garden with a cover crop of winter rye (Secale cereale) to optimize soil quality. Compost and agricultural lime may be added to the soil prior to sowing the rye. Hardy perennials with leaves still green and functional should be allowed to remain standing for as long as possible. Some gardeners like to let top-growth linger through the winter, hoping to provide themselves with a bit of winter interest, and to provide small birds with forage. However, plant stems flattened and macerated by snowfall will be much more difficult to cut back in the spring. Ornamental grasses illustrate these points perfectly. My rule is: Once the past season's growth becomes less than interesting, it's time to reach for the pruning shears. Michael Weishan and Kip sowed the Victory Garden vegetable beds with winter rye to provide ground cover till spring. Nor are container gardens exempt from winter protocols. If you store your pots outdoors, empty them completely and place them upside-down. Terra cotta containers tend to absorb water, which will freeze and cause spalling  surface flaking and deterioration. Store pots under cover to keep them dry. For more information on resources used on the show, visit our Resource Directory. This segment appears in show #2726.